The 2011 season may have started in December of 2010, but January is the month when it really kicks into gear as the professionals look to hone their game for the Masters in April. To qualify for the Hyundai Tournament of Champions you need to have won on the PGA Tour in 2010, so the field is small and guaranteed to be full of quality. Geoff Ogilvy has been unstoppable in this tournament in the past two years, and the 2009 and 2010 winner once again heads the betting market and is 8/1 to win the Tournament of Champions. The absence of Tiger Woods, who failed to win a PGA Tour tournament in a season for the first time since his debut season, means the betting for the tournament is wide open and plenty of pros are in with a chance. Surprisingly, Graeme McDowell is only the joint third favourite and last year’s US Open Champion is 12/1 to make a winning start to 2011 and continue on his fine run of form which has seen him become one of the world’s top golfers. His Ryder Cup team-mate Ian Poulter finished 2010 playing the best golf of his career and at 20/1 to win the Tournament of Champions, Poulter offers plenty of value. Ernie Els had one of his finest seasons on tour in 2010 and that is the reason he is the 10/1 second favourite to win this week but his fellow countryman Tim Clark offers more value at 25/1. Clark enters the tournament on the back of seven straight top 25s and is one to watch this week. 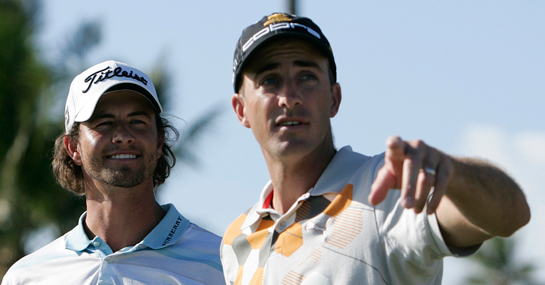 But Adam Scott can help Ogilvy to a one-two for the Australians, Scott has three top tens in four starts at this event and is 20/1 to win this week. A £10 stake on Justin Rose winning the Tournament of Champions would return £340. New customers can sign up here for a free £10 bet.